Radiology Quiz! .. Are you Smart!! Try it out!! Thread: Radiology Quiz! .. Are you Smart!! Try it out!! Here you go.. Tell me your diagnosis..
Mr X, was admitted yesterday with a h/o of frequency of micturation, but when he start to urinate, there is sudden stoppage of outflow? Wat is your most likely diagnosis..
Give your answers in brief !! 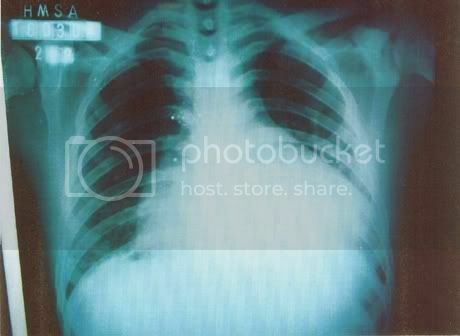 Ok..
Press Thanks button to see the xray! Last edited by Asrafee; 02-08-2007 at 08:13 PM. Can bladder schistosomiasis be included in differentials? mmmmmmmm... I dunno.. But i think that it wont be visible on xray anyways! hahha.. At first i thought you said for the second one!!! wat abt the second one, any guess? Final Dx: Left ventricular failure! OOps i forgot the diagnosis..